The elevator shaft/sign on Beale Street Landing didn't look big. In fact it didn't really even show up. It was just a small gray box on top of a grass-roofed glass and concrete building. The building was large, but it looked like it was going to blend in with the River and the views. That was this spring, when the project was under review again because some pods and walkways were being eliminated. Groups and people met with the RDC to consider the changes. As always, the illustrations of the building showed the elevator shaft as gray, and everyone agreed that the landscaping changes would make the project less intrusive, more natural, and minimize its adverse effect on the adjacent Cobblestone Landing. That was before the elevator shaft turned out to be about the size of an interstate exit sign, and plans for it to be bright and multi-colored surfaced. At the Memphis Downtown Commission Design Review Board (DRB) meeting on May 2, 2012, while the amended design and a sign application were being considered, "colors" on the shaft were first mentioned. Only a black and white diagram (below) and the project overall illustration that showed a gray shaft were on hand, and there were no sample materials. Review was postponed. Later in May, the first color illustrations of the shaft surfaced. And there wasn't just one illustration; there were two. They showed different colors and were sent by the RDC on the same day to two different review bodies: one to the DRB and a different one to the TN Department of Transportation. Now both bodies have the same color illustration to review. It's the one on the left that looks like a night-view with back lit letters and logo. The DRB meeting is at the Memphis Downtown Commission (114 North Main Street), Wednesday (July 11) at 5 pm. The staff has taken the position that the colored shaft was approved by the DRB in 2008, but a review of the meeting minutes and illustrations presented in 2008, shows that the colors were never presented for review. 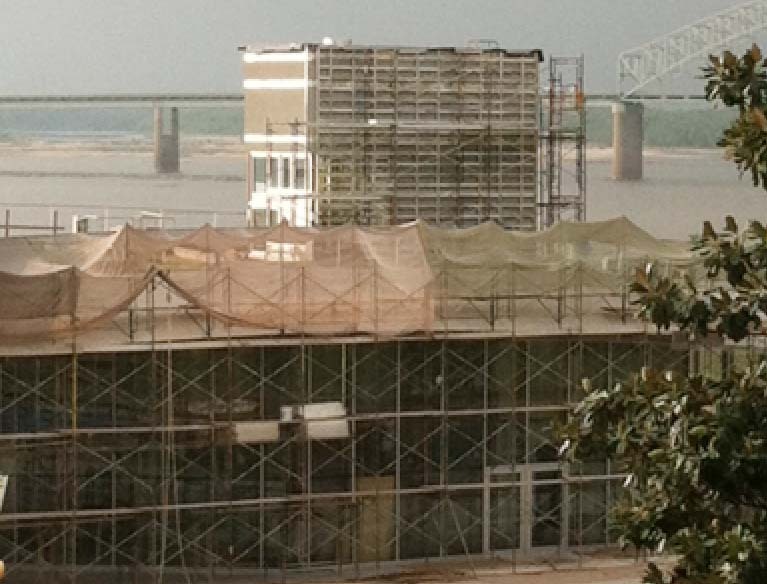 Meanwhile, even though the topper hasn't been approved, workers are busy down at Beale Street Landing putting up the substrata framework for the colored panels. DRB meetings are open to the public. Or if you'd like to send your comments, you may mail them to Paul Morris morris@downtownmemphis.com and ask that they be presented to and considered by DRB board members.